Sheltered by the towering oaks and surrounded by the beautiful wine country of Sonoma, your guests will be filled with awe as you utter the timeless words: I do. 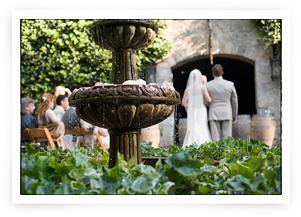 Buena Vista Winery is proud to host unforgettable evening ceremonies and receptions in our outdoor Fountain Courtyard located in front of the recently renovated Champagne Cellars – built in 1864. Maximum capacity is 200 guests. Wedding ceremonies and receptions are held at the historic winery in the evenings from 5:00 pm to 10:00pm. There is a 10% discount on all wines purchased for your event.